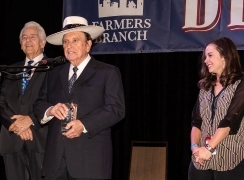 Bobby Osborne, a veteran bluegrass musician and a GRAMMY-nominated member of the Grand Ole Opry, was honored with the Bluegrass Heritage Foundation’s Bluegrass Star Award® on Saturday, October 20, 2018 at the Bloomin’ Bluegrass Festival at the Omni Dallas Hotel at Park West in Farmers Branch, Texas. (The Bloomin’ Bluegrass Festival, typically held in the Farmers Branch Historical Park, was moved inside the Omni for 2018 due to extraordinarily wet conditions in the park.) Osborne was joined on stage by Del McCoury and Sierra Hull, both of whom have received the Bluegrass Star Award. “In 2010, the Bluegrass Heritage Foundation began a tradition of honoring bluegrass artists who do an exemplary job of advancing the music and bringing it to new audiences while preserving its character and heritage,” said Alan Tompkins, founderof the Bluegrass Heritage Foundation. Previous Bluegrass Star Awards have been presented to Rhonda Vincent, J. D. Crowe, Peter Rowan, Sierra Hull, Ricky Skaggs, and Del McCoury. “Bobby Osborne has had an incredible career in bluegrass music spanning 70 years, which includes the time he spent serving his country as a United State Marine. He’s in the Bluegrass Hall of Fame not once but twice – both as a member of the Lonesome Pine Fiddlers and as a member of the Osborne Brothers – the group that he founded with his brother, Sonny Osborne. 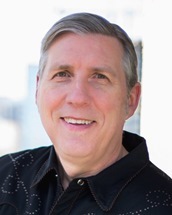 Bobby is a member of the Kentucky Music Hall of Fame who now spends his time helping young musicians as a member of the Kentucky School of Bluegrass and Traditional Music, located in Hyden, Kentucky and directed by Dean Osborne. Throughout his career, Bobby Osborne found new and innovative ways to make bluegrass music interesting for listeners all around the country. 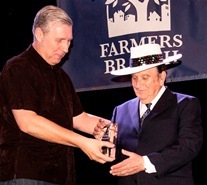 He’s brought bluegrass to thousands of new listeners during his career and is certainly deserving of our Bluegrass Heritage Foundation Bluegrass Star Award®.” For information about Bobby Osborne, visit his website or the Bobby Osborne page on Wikipedia.com. Video of the award presentation courtesy of David Seay Productions. Photos courtesy of Perry Callahan. 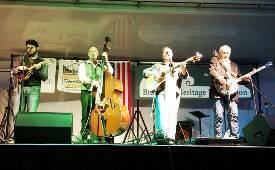 Kentucky Just Us, the O’Neal family bluegrass band from Greensburg, Kentucky, was awarded a $1,000 scholarship by the Bluegrass Heritage Foundation on Saturday, October 20, 2018 at the Bloomin’ Bluegrass Festival at the Omni Dallas Hotel at Park West in Farmers Branch, Texas. 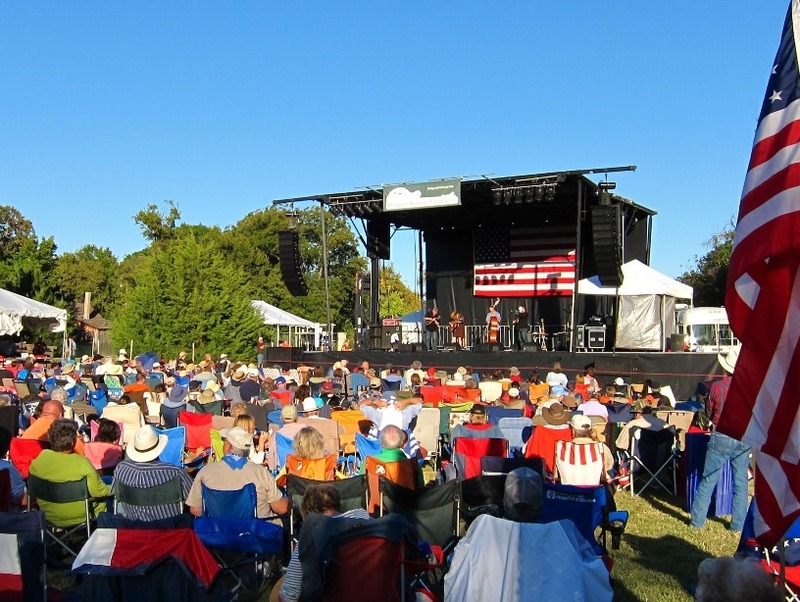 (The Bloomin’ Bluegrass Festival, typically held in the Farmers Branch Historical Park, was held in the Omni for 2018 due to wet conditions in the park.) The scholarship was funded in part from donations to the Bluegrass Heritage Foundation’s Johnny Lee Vincent Memorial Scholarship Program. The band played a short set before the scholarship presentation and wowed the crowd at the Bloomin’ Bluegrass Festival. Several members of the Kentucky Just Us family band are enrolled in classes where they are studying bluegrass music at the Kentucky School of Bluegrass and Traditional Music in Hyden, Kentucky, which is a part of the Hazard Community and Technical College. 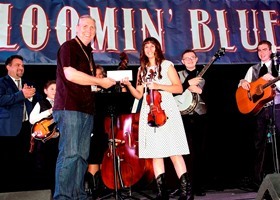 Dean Osborne directs the bluegrass music program, and joined the band on stage for the scholarship presentation. 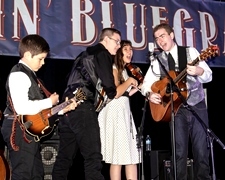 “We’re so excited to help this terrific young band develop their already-outstanding bluegrass musical skills, and we know they are in the good hands of Dean Osborne, Scott Napier, Virgil Bowlin, and – of course – Mr. Bobby Osborne at the Kentucky School of Bluegrass,” said Foundation president Alan Tompkins. The Johnny Lee Vincent Memorial Scholarship Program is named in memory of Mr. Johnny Vincent of Greentop, Missouri, a bluegrass pioneer and the father of the Foundation’s first Bluegrass Star Award® recipient, Rhonda Vincent, and bluegrass star Darrin Vincent. Johnny was known for his unique banjo style and founded the Sally Mountain Bluegrass Festival in Queen City, Missouri. The Bluegrass Heritage Foundation appreciates the support of Mr. Vincent’s family and friends and our many donors and volunteers, all of whom make it possible for us to assist young people in making bluegrass happen. The photos of Kentucky Just Us are courtesy of Perry Callahan. Alan W. Tompkins, President and founder of the Bluegrass Heritage Foundation, has been nominated, for a third year in a row, by the International Bluegrass Music Association (IBMA) for the Bluegrass Broadcaster of the Year Award based on his work on the Bluegrass Heritage Radio Show. The winner will be announced at a luncheon on Thursday Sept. 27 in Raleigh, North Carolina. The IBMA Bluegrass Broadcaster of the Year Award recognizes outstanding service to bluegrass music in the field of broadcasting. Recipients are judged on their contributions to the field of endeavor, professionalism (including their work in their community), and their ability to foster the image of bluegrass music. Starting with IBMA member recommendations, nominees are chosen by committees of respected musicians and industry leaders. 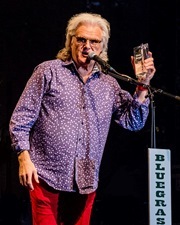 Ricky Skaggs, a 15-time GRAMMY-winner, was honored with the Bluegrass Heritage Foundation’s Bluegrass Star Award® on Friday, October 20, 2017 at the Bloomin’ Bluegrass Festival and Chili Cook-Off in the Farmers Branch Historical Park in Farmers Branch, Texas. “In 2010, the Bluegrass Heritage Foundation began a tradition of honoring bluegrass artists who do an exemplary job of advancing the music and bringing it to new audiences while preserving its character and heritage,” said Alan Tompkins, president of the Bluegrass Heritage Foundation. The previous Bluegrass Star Awards® have been awarded to Rhonda Vincent, J. D. Crowe, Peter Rowan, Sierra Hull, Del McCoury, and Jerry Douglas. 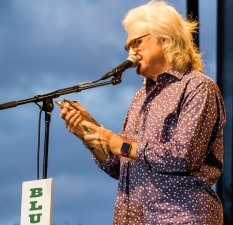 Ricky Skaggs has had an incredible career in bluegrass music, and started playing on stage with artists including Bill Monroe, Lester Flatt, and Earl Scruggs before he was seven years old. He played bluegrass music as a member of the Clinch Mountain Boys, JD Crowe & The New South, and Boone Creek before touring with Emmylou Harris’s Hot Band and beginning his solo country music career. As a country singer, he achieved 12 #1 hits, 8 CMA awards, and 8 ACM awards, and became the youngest member ever of the Grand Ole Opry. Over the years, he’s teamed up with Keith Whitley, Bruce Hornsby, Phish, Ry Cooder, the Whites, Barry Gibb, and many others. He holds an incredible 15 GRAMMY awards as well as an honorary doctorate from the Berklee School of Music, and since 1996 has led his incredible nationally-renowed and award-winning bluegrass band, Ricky Skaggs & Kentucky Thunder. Ricky Skaggs is a true superstar and an innovator who came from bluegrass music roots and made the whole world sit up and listen. The Bluegrass Heritage Foundation is proud to have him as the recipient of its seventh Bluegrass Star Award®. For information about Ricky Skaggs, visit his website at RickySkaggs.com. Video of the award presentation courtesy of David Seay Productions. Photos courtesy of Nathaniel Dalzell. The Bloomin’ Bluegrass Festival & Chili Cook-Off, now in its eighth year and presented by the Bluegrass Heritage Foundation and the City of Farmers Branch, Texas, has been nominated for a second time for the Bluegrass Event of the Year Award by the International Bluegrass Music Association. The award will be presented at the IBMA’s World of Bluegrass Conference Luncheon on Thursday, September 28, 2017, in Raleigh, North Carolina. According to IBMA, the award recognizes events for their outstanding accomplishment and service to bluegrass music in the field of event production. The recipients are judged by the IBMA’s select committee for their overall contributions to the field of event production, professionalism and quality of presentation, work furthering bluegrass in their area of service, and demonstrated ability to foster bluegrass music’s image. Alan W. Tompkins, President and founder of the Bluegrass Heritage Foundation, has been nominated, for a second year in a row, by the International Bluegrass Music Association (IBMA) for the Bluegrass Broadcaster of the Year Award based on his work on the Bluegrass Heritage Radio Show. The winner will be announced at a luncheon on Sept. 28 in Raleigh, North Carolina as part of IBMA’s World of Bluegrass. The Broadcaster of the Year Award recognizes outstanding service to bluegrass music in the field of broadcasting. Recipients are judged by the award committee for their contributions to the field of endeavor, professionalism (including their work in their community), and their demonstrated ability to foster the image of bluegrass music. Starting with IBMA member recommendations, nominees are chosen by committees of respected musicians and industry leaders. 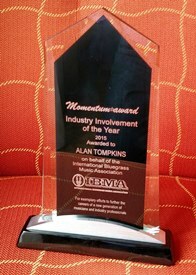 Alan received the IBMA Momentum Award for Industry Involvement in 2015. That award honors exemplary efforts to further the careers of a new generation of musicians and industry professionals. 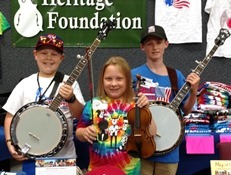 12-year-old banjoist Nate Jennings and his little sister, Gigi Jennings, of Tyler, Texas, as well as Riley Gilbreath of Fort Worth, Texas attended the eleventh annual Acoustic Music Camp in Arlington, Texas (July 27-29, 2017) thanks to the Johnny Lee Vincent Memorial Scholarship Program. 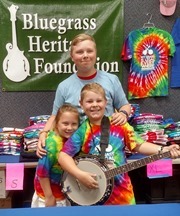 Nate attended the camp last year and did a great job on banjo, and Gigi has been making progress as a young fiddler. Riley Gilbreath has been advancing rapidly as a musician and banjoist and particularly enjoyed attending the advanced banjo classes taught by Bill Evans and Tony Trischka. (Riley’s first banjo was provided by our Play It Forward!™ Instrument Lending Program, but he already moved on to buy his own Recording King banjo! The Acoustic Music Camp faculty included accomplished banjoists Tony Trischka, Bill Evans, and Gerald Jones. Other renowned faculty included Robert Bowlin, Tim May, Gretchen Priest-May, Paul Glasse, Brad Davis, Dix Bruce, and Roberta Rast. The Johnny Lee Vincent Memorial Scholarship Program is named in memory of Mr. Johnny Vincent of Greentop, Missouri, a bluegrass pioneer and the father of the Foundation’s first Bluegrass Star Award® recipient, Rhonda Vincent, and bluegrass star Darrin Vincent. Johnny and his family toured the world as the Sally Mountain Show, performing their special brand of bluegrass music. He was known for his unique banjo style and founded the Sally Mountain Bluegrass Festival in Queen City, Missouri. The Bluegrass Heritage Foundation appreciates the support of Mr. Vincent’s family and friends, our other donors and volunteers, and all who help make it possible for us to assist young people like Nate and Gigi Jennings and Riley Gilbreath. 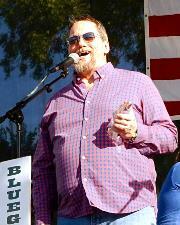 Jerry Douglas, a 14-time GRAMMY-winning National Heritage Fellow, was honored with the Bluegrass Heritage Foundation’s Bluegrass Star Award® on Saturday, October 15, 2016 at the Bloomin’ Bluegrass Festival and Chili Cook-Off in the Farmers Branch Historical Park in Farmers Branch, Texas. 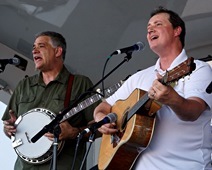 “In 2010, the Bluegrass Heritage Foundation began a tradition of honoring bluegrass artists who do an exemplary job of advancing the music and bringing it to new audiences while preserving its character and heritage,” said Alan Tompkins, president of the Bluegrass Heritage Foundation. The previous Bluegrass Star Awards® have been awarded to Rhonda Vincent, J. D. Crowe, Peter Rowan, Sierra Hull, and Del McCoury. “Jerry Douglas has had an incredible career in bluegrass music spanning much of the past five decades. He holds an incredible 14 GRAMMY awards, a National Heritage Fellowship Award from the National Endowment for the Arts, three Musician Of The Year awards from the Country Music Association, and has been an Artist In Residence at the Country Music Hall of Fame & Museum. Jerry Douglas has toured and recorded with Alison Krauss & Union Station for over 20 years and founded the GRAMMY-winning band The Earls of Leicester. Jerry has recorded with artists such as Eric Clapton, Ray Charles, Mumford & Sons, Elvis Costello, and Dolly Parton, bringing the bluegrass sound to audiences everywhere. Jerry has brought bluegrass to many who might never have been interested in it before hearing him, and well deserves our Bluegrass Heritage Foundation Bluegrass Star Award®.” For information about Jerry Douglas, visit the Jerry Douglas page on Wikipedia.com. Video of the award presentation courtesy of David Seay Productions. Photos courtesy of Bob Compere. 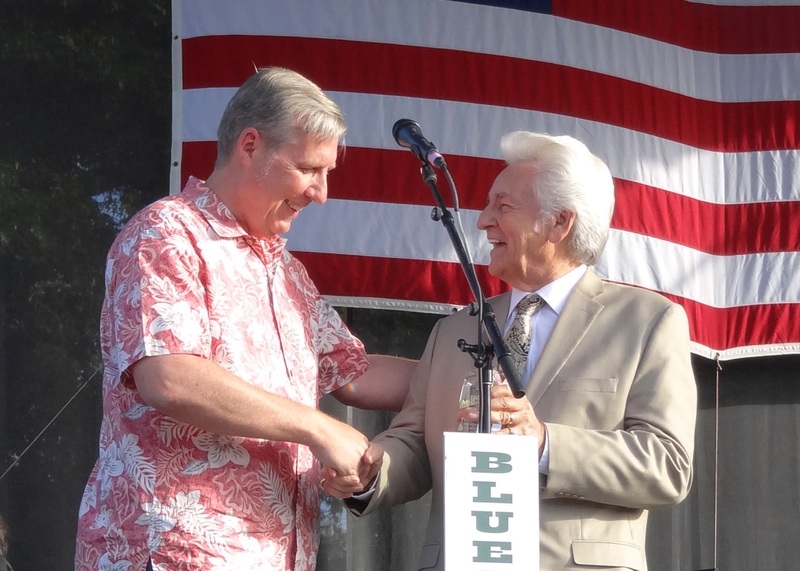 Alan W. Tompkins, President and founder of the Bluegrass Heritage Foundation, has been nominated by the International Bluegrass Music Association (IBMA) for the Bluegrass Broadcaster of the Year Award based on his work on the Bluegrass Heritage Radio Show. The winner will be announced at the Special Awards luncheon on Sept. 29 in Raleigh as part of IBMA’s World of Bluegrass. 11-year-old banjoist Nate Jennings and his 14-year-old guitarist brother, Tom Jennings, of Tyler, Texas, attended the tenth annual Acoustic Music Camp in Arlington, Texas (August 11-13, 2016) under the Johnny Lee Vincent Memorial Scholarship Program from the Bluegrass Heritage Foundation. (Younger sister Gigi, an aspiring fiddler, enjoyed hanging out at camp while her brothers attended classes.) Tom has been playing guitar for about 18 months. Younger brother Nate (already a ukulele player) became inspired to play banjo by listening to bluegrass on The Ranch, KKUS-FM, in Tyler, hosted by Julie Tucker, Dave Rousseau, and Corey Coleman. (Nate’s banjo was provided by our Play It Forward!™ Instrument Lending Program.) The Acoustic Music Camp faculty included accomplished banjoists Tony Trischka, Alan O’Bryant, and Gerald Jones. Other renowned faculty included Robert Bowlin, Tim May, Nate Lee, Ivan Rosenberg, Jim Hurst, Dix Bruce, and Dave Hamburger. The Bluegrass Heritage Foundation appreciates the support of Mr. Vincent’s family and friends, our other donors and volunteers, and all who help make it possible for us to assist young people like Nate and Tom Jennings. The Wylie Jubilee – Bluegrass on Ballard was a great success again this year, with the fun all centered around the stage in the center of historic downtown Wylie, Texas. Thousands of folks enjoyed live bluegrass music as well as great food, a spectacular car show, pony rides, arts and crafts, and more – all free of charge. The Wylie Jubilee – Bluegrass on Ballard was capped off by a spectacular pyrotechnics high above the stage, courtesy of the City of Wylie. Check our photo gallery for great event photos. The musical lineup included Greg Cahill and the Special Consensus, Texas & Tennessee (with John R. Bowman, Steve Huber, Alan Tompkins, and Ron Inscore), Sgt. Pepper’s Lonely Bluegrass Band, the Downtown String Band, Strings of Faith, (with Alan Tompkins, Gerald Jones, Dale Morris, Jr., and Michael Morrison), and Phil Ferguson & Texas True! A highlight of the day was when Patience Newsom of Plano, Texas received her beginning banjo through the Bluegrass Heritage Foundation Play It Forward! Instrument Lending Program! Foundation president Alan Tompkins presented the banjo to Patience and her father at the Foundation table near the stage. Patience plans to take banjo lessons from Gerald Jones, so we should be seeing her on stage sometime soon! We were thrilled with Mr. Phil Ferguson of Phil Ferguson & Texas True made a surprise presentation of a beautiful Yamaha 6-string acoustic guitar to the Foundation for use in the Play It Forward! Instrument Lending Program. 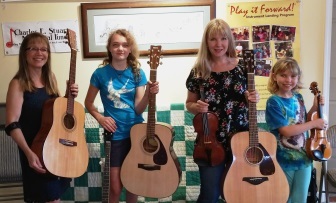 Mr. Ferguson complimented the Foundation for its efforts in making bluegrass musical instruments available to young people through the program, and expressed his hope that a future great guitarist might get his or her start on the donated instrument. This event was made possible by Wylie Downtown Merchants Association, City of Wylie, North Texas Equestrian Center, the Bluegrass Heritage Foundation, and many other fine sponsors. Photos by Bob Compere, Theresa Laney Clayton-Duffee, and Julie Tompkins. Families explored the Dallas Heritage Village buildings and exhibits and enjoyed a picnic in the park all afternoon. Bluegrass music rang from the porches and pathways as jammers picked their favorite tunes. 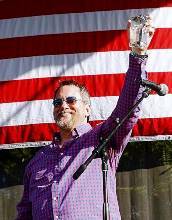 It was a day of family-friendly music and fun. 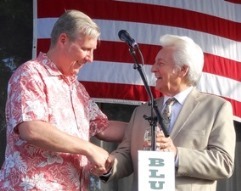 Del McCoury, a GRAMMY-winning National Heritage Fellow and member International Bluegrass Music Association’s Hall of Fame, was honored with the Bluegrass Heritage Foundation’s Bluegrass Star Award® on Saturday, October 17, 2015 at the Bloomin’ Bluegrass Festival and Chili Cook-Off in the Farmers Branch Historical Park in Farmers Branch, Texas. 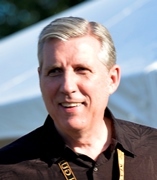 “In 2010, the Bluegrass Heritage Foundation began a tradition of honoring bluegrass artists who do an exemplary job of advancing the music and bringing it to new audiences while preserving its character and heritage,” said Alan W. Tompkins, president and founder of the Bluegrass Heritage Foundation. The previous Bluegrass Star Awards® have been awarded to Rhonda Vincent, J. D. Crowe, Peter Rowan, and Sierra Hull. 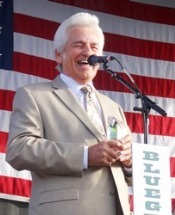 “Del McCoury has had an incredible lifetime career in bluegrass music spanning the better part of six decades. He’s won almost every award given to musicians in our industry, including a GRAMMY and a National Heritage Fellowship Lifetime Achievement Award from the National Endowment for the Arts, has played bluegrass music on national television, and was a Bluegrass Boy alongside Bill Monroe. You just can’t get much more ‘true bluegrass’ than that. Del McCoury has played and recorded with artists as diverse as Phish, the String Cheese Incident, and Steve Earle, bringing the bluegrass sound to audiences far and wide. 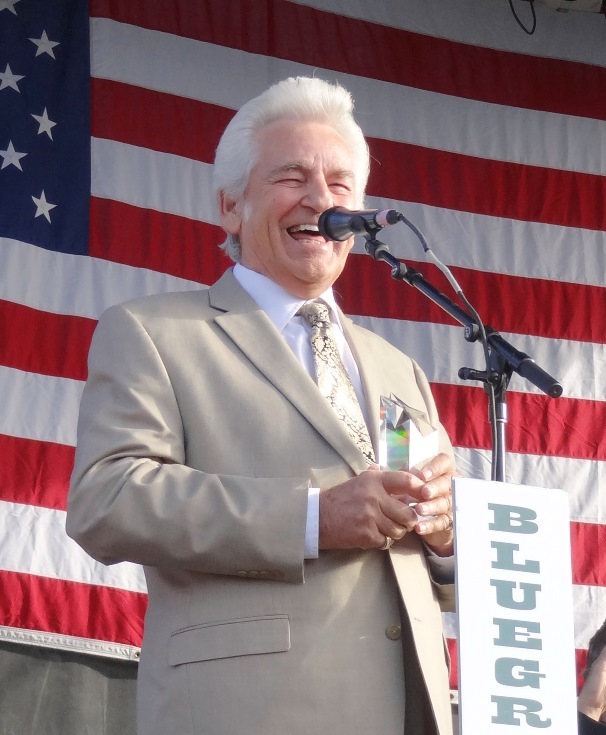 Del has brought bluegrass music to many who might never have heard it or been interested in it before hearing him, and is an ideal recipient for our Bluegrass Heritage Foundation Bluegrass Star Award®.” For more information about Del McCoury, visit the Del McCoury Band website. Watch the award presentation video below, courtesy of David Seay Productions for highlights of Del’s career – in Del’s own words. Photos are courtesy of Julie Tompkins. 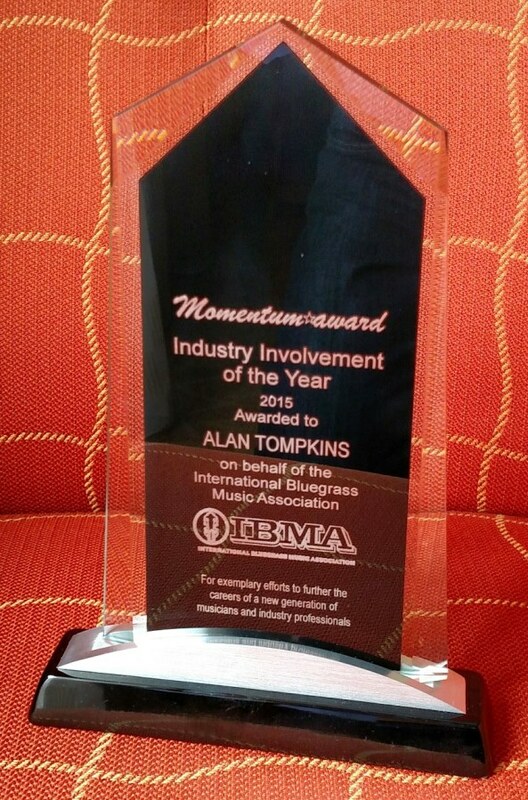 Alan W. Tompkins, President and founder of the Bluegrass Heritage Foundation, was honored with the 2015 Momentum Award for Industry Involvement by the International Bluegrass Music Association (IBMA) at a luncheon on September 30 in Raleigh, North Carolina, as part of IBMA’s World of Bluegrass. The Momentum Award for Industry Involvement honors exemplary efforts by the recipient to further the careers of a new generation of musicians and industry professionals. The Momentum Awards were created to recognize musicians and industry professionals who, while in the early stages of their careers, have contributed to, or had an influence on, bluegrass music. Starting with recommendations from IBMA members, nominees are chosen by committees in a process involving respected musicians and industry leaders. keeping the doors open isn't free. All contributions are greatly appreciated. YOUR INQUIRIES AND DONATIONS ARE WELCOMED! Heritage Festival, Lone Star Fest, and Lone Star Fest banner designs are trademarks of Bluegrass Heritage Foundation, Reg. U.S. Pat. & Tm. Office.